The League produces a monthly online newsletter, inLEAGUE, plus two printed publication each. These publications are distributed to members only as a benefit of membership. Each inLEAGUE carries stories related to best practices in the field and the tools and techniques required to sustain historic theatres for the benefit of their communities and future generations. LHAT regularly solicits articles from the membership. 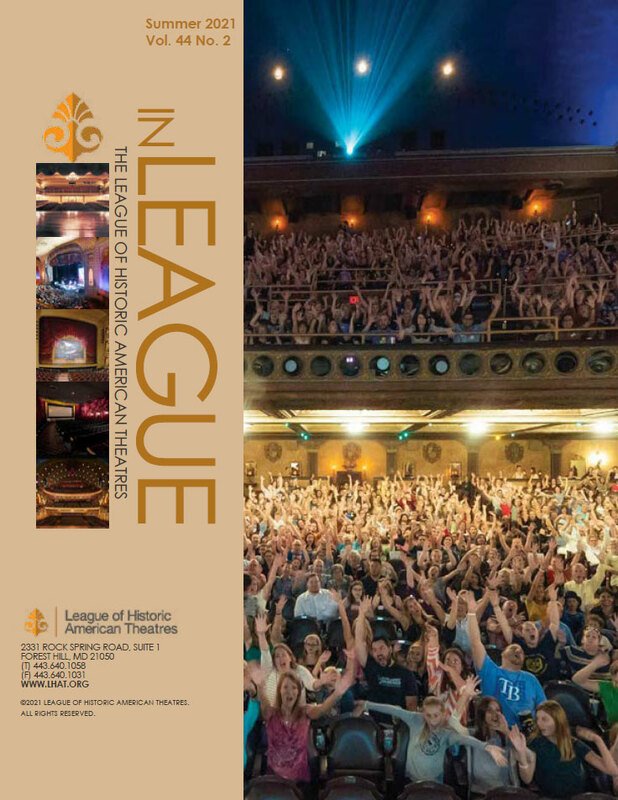 The Summer Publication, a combination of the summer issue of inLEAGUE and the National Conference Program, is printed in July in full color and is distributed to 250-300 conference attendees plus LHAT members who are unable to attend the event. The Historic Theatre Resource Guide & Allied Member Directory is printed each fall as an issue of inLEAGUE, containing historic theatre industry reports and trends and other articles, plus detailed listings for all of LHAT's service provider and supplier (Allied) members. Sample documents provided by member theatres, such as theatre position descriptions, handbooks, policies, etc. Online resources available to anyone include the LHAT Rescue & Rehab Manual and the Historic Theatre Inventory. The LHAT Member Directory and Database, and other online theatre resources. Why should you advertise in the next inLEAGUE? Advertising in LHAT Publications allows you to promote your products and services to a targeted audience comprised of key decision-makers actively engaged in and committed to rehabilitating, operating and sustaining historic theatres. We currently have more than 300 member historic theatres. 60% of our operating theatre members reported in a recent survey that they have capital projects on the horizon. Many more member theatres, that are not yet operational, are currently or have future plans to renovate, restore and/or expand to make their venues fully operational again. The Historic Theatre Resource Guide / Allied Member Directory (distributed each fall). Advertising information is made available in August. Space reservation deadline is in early October. The Annual Conference Program / Summer inLEAGUE (distributed each July). Advertising rates and deadlines are published in the spring. Space reservation deadline is in early June. If you are interested in advertising, please email info@lhat.org to express your interest and so we can ensure you receive detailed information when it becomes available.